Cabbage (Brassica oleracea Capitata Group) is an edible plant. It is a lot like broccoli, cauliflower or Brussels sprouts. Cabbage is eaten in many ways around the world. Coleslaw and sauerkraut are popular foods that use cabbage. It is also used to make kimchi and borscht, and can also be used in salads. Red cabbage juice can be used as a pH indicator. Cabbages are usually green, but they can also be red. Cabbages can come in many different types, such as the previously mentioned red and green cabbages, but they can also be in other types. 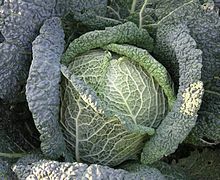 These include white cabbage, also known as Dutch cabbage, and Savoy cabbage. This page was last changed on 19 September 2018, at 20:09.